Without added selenium the reduction of mercury may be considered to be nil, or 0 %. Doubtful results of a large number of emission measurements in Swedish crematories have contributed to the decision of the four authorities to co-operate in an emission investigation. Earlier, good and bad measuring results have alternated without any obvious logical explanation. Contrary, in the present investigation all measuring results were logical and according to expectation. In most emission measurements that have been performed in crematories the amount of mercury present in the jaw amalgam of the deceased is not taken into account, which will create undeserved good reduction results. It is therefore positive that the Swedish National Environment Protection Board (Naturvårdsverket) now (February 5, 2002) states that the mercury output value shall be calculated with the presumption that the deceased has contributed 5 grams of Hg in the cremation. 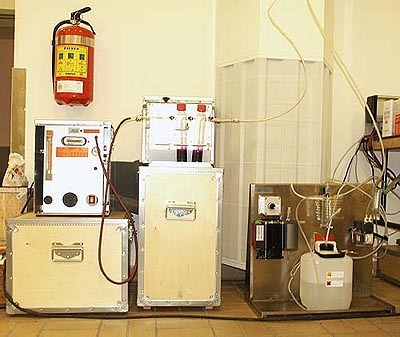 It was in the light of these facts that the four authorities brought their knowledge together to create a new and more reliable means of making emission measurements in crematories. It should be observed that this was the first time that both instrumental and wet chemistry measurements were made on one and the same flue gas. The plan of this probably largest measurement series ever designed in this country promised to guarantee a high level of measurement certainty. The measurements were made during 14 days in each of the two crematories and included in total 48 cremations. The 14-day measuring period in Landskrona was already one of the longest made in a Swedish crematory. However, this was only an introduction to a bold venture that was to continue for another 14 days in Höganäs. Since the investigation comprised 48 cremations in two crematories and utilised two types of measuring technology it is, as far as we know, the most extensive and reliable one made in Sweden. 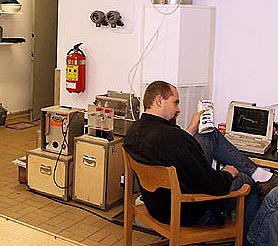 The instrumental measurements began in the Landskrona crematory on May 25th, 2001. The instrument, Semtech Hg 2010, Mercury Analyser with converter is approved by TÜV for measurements according to the new TA-Air 2000 protocol. 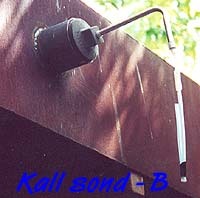 The instrument was installed indoors in the oven hall and was connected with teflon tubing to the measuring probes that in this case were placed outdoors (see picture). The installation was made by an accredited measuring firm, Metlab miljö AB. 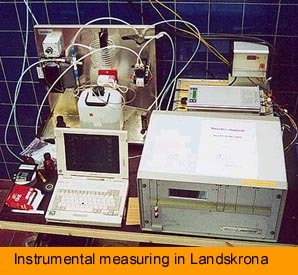 Instrumental measuring as it was applied in Landskrona is a superior method for studying mercury exhausts in cremations. It instantaneously displays reliable results and possible sources of error are immediately exposed, without week-long delays. The crematory personnel can handle the instrument after a short instruction and training period. Complementary measurements with the wet chemistry method in Höganäs The direct displaying instrument makes clear important courses of events that earlier have not been possible to follow. The immediate representation on the screen unmasks e.g. the erroneous statement that lingering mercury influences the result. The results obtained are shown in the bar graph. They were almost equal in the two installations in Landskrona and Höganäs when the ampoule was used. In comparable cremations the emission results were logical and according to expectation with respect to added mercury and selenium. The storing stability of the end product mercury selenide (HgSe) is 100%, and when the ampoule is present the results are therefore relevant also on s long-term basis. It was also concluded that supplying sulphur instead of selenium did not have any Hg-reducing effect. Possible emissions of mercury selenide or selenium will fall down as dust within the cemetery's premises according to spreading calculations made by SMHI (The Swedish Meteorological and Hydrological Institute) with the program Dispersion. 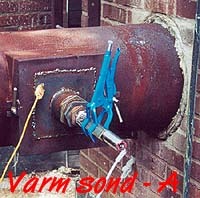 The Landskrona crematory had used the selenium ampoule for many years and the oven was therefore well impregnated with selenium when the measurements were started. In the Höganäs crematory the selenium ampoule had not been used earlier when the measurements there started on October 25, 2001. This created a possibility to document the difference in Hg emissions in cremations without and with ampoule containing 9 grams of selenium. Therefore, cremations were initially made without ampoule so that a selenium impregnation would not influence subsequent measurements in those cremations that were made without selenium addition. 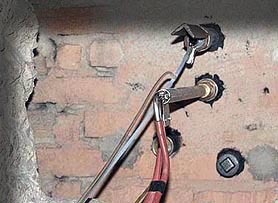 The Semtech was placed first in the gas flow and did not influence the gas in any way. The two methods can be used simultaneously, which gives a unique control and reliable results. As far as we know, this was the first time that emission measurements were made in such a controlled way in a crematory. It turned out that the Semtech detected slightly higher emissions than what was shown with the wet chemistry method.